Some weeks ago we talked about the advantages of planning holidays with the help of social networks. We are burning for going on summer holidays, and we have decided to start adapting by analysing the social networks of two of the preferred websites by travellers to find accomodation. Each has its own particular travel philosophy, but… Do you want to follow us during this virtual holidays? The number of websites to find temporary accomodation have multiplied in the past months. And for a good reason: according to a study by Webloyalty, 75% of travellers use the internet to plan their holidays. But where do social networks come in in all this? The social media strategy for a holidays accomodation website is almost as important as ensuring that the site works properly. Customers need to be informed, well served and, especially, to feel that the website is providing them something that nobody else can offer. Airbnb has taken off in the past years, becoming one of the most renowned online services globally. In fact, since 2009 256,000 travelers went to Madrid booking via Airbnb. Its position of leadership has helped the company to take good care of its online presence. We have already talked about the importance of social networks as the cover letter of a brand. Airbnb seeks to be inspiring on its Twitter and Facebook profiles. It shares many pictures with dream houses and locations to spend holidays. It also encourages users to share their experiences vita retweet and clicking on “Like” to the experiences they receive. Without doubt, this is a way to reinforce this sense of community that they have generated during the past five years. The response is great, since they do not only reply to users with complaints or doubts, but they also interact with those that leave pictures or positive comments on other publications. If one of the goals of the social networks of brands is to create a conversation, Airbnb is clearly outstanding in this respect. 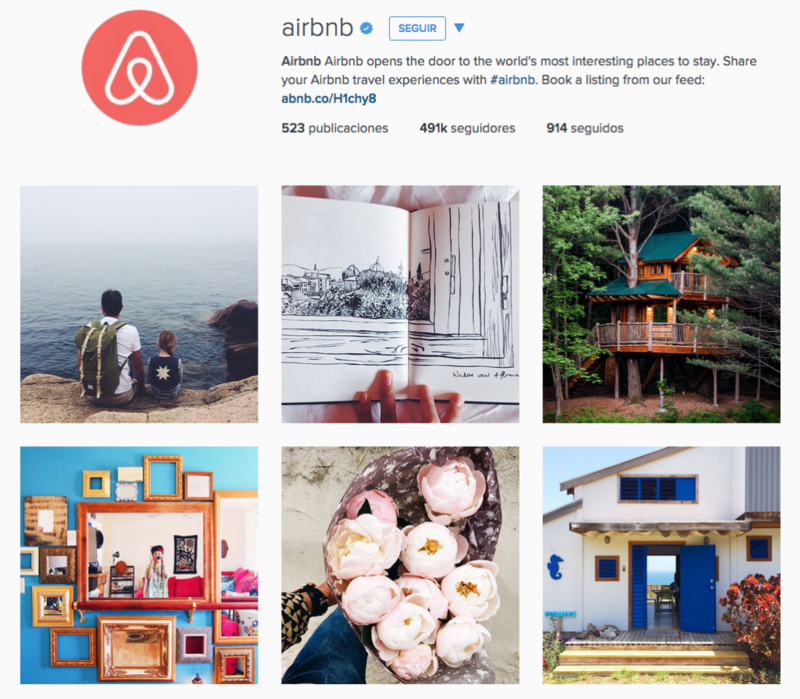 Using creativity and visuals, Instagram, Pinterest and YouTube are catching up with the inspiration by Airbnb. Airbnb has a blog as well. It is international, managed from their office in the US, and with content in English. Another option for a cheap stay is Couchsurfing, for travellers that want to share a house with locals and live a more authentic experience. While Airbnb is for inspiration and finding cheap alternatives to travellers, Couchsurfing is about creating a sense of community and promoting new friendships. As for social networks, Couchsurfing does not have profiles in Spanish, but we have analysed their networks in English and we can tell that their main focus is put on users sharing stories, reinforcing this sense of community. They use the hashtag #csgenerosity in all their social networks as a form to promote the humane side of the site. Human generosity makes possible visiting other parts of the world. And it seems like it works: users reply to the initiative and share pictures with their hosts or their destinations. Almost all the content that Couchsurfing publishes turns around the idea of showing the pros of travelling with locals. 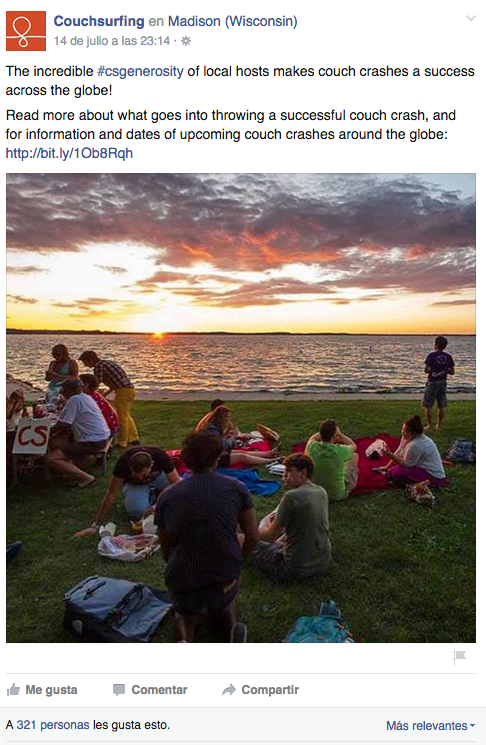 The visual content is mostly shared by their users and that Couchsurfing uses to illustrate its profiles. In this sense, it is far from the attention to detail by Airbnb, but at the same time it keeps this line of travelling sharing and learning from each other. Is there a better way to share experiences than through a blog? The Couchsurfing blog has testimonies, pictures, travel routes, tips, news about the web… All this focused with the goal that travellers feel closer to the couchsurfers family. Now that we have studied both options, let’s charge our smartphones and pack our backpacks, because whether it is in a private home or a stranger’s sofa, we leave for the summer!